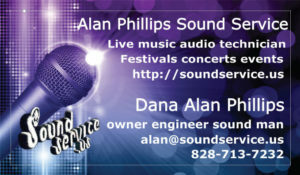 Looking for a professional audio technician, also known as a “sound man?” Alan Phillips is a qualified Audio System Engineer with a talent for creating an atmosphere of natural sounding amplified music. Do you need to rent an audio technician along with sound equipment? With numerous years of sound experience in the corporate and entertainment industries, we deliver temporary audio systems to many functions and events. Of course a Sound Service technician will be there for the duration of the event. Audio engineering specialties include acoustic music, concerts, conferences, festivals, graduations, musical productions, sound design, Public Address, parties, amplified wedding vows, and receptions. We supply floor standing speakers for indoor and outdoor events regardless of the weather. For many events, having the participants tripping over wires is a concern, therefore a wireless solution is employed. Wireless mixing gives an audio technician the freedom to engineer live sound from anywhere in the venue. Since the sound mixer and equipment stay on stage, there isn’t a mixing console or sound canopy to obstruct the view. Digital amplification and LED lighting trees minimize equipment space and power requirements compared to that of analog systems. When requested, a 32 track live recording of the event may be mixed down to stereo, ready for download. Additional rates may apply. Audio spectrum analysis and speakers tuned to the room. We also re-cone and repair speakers, cabinets, and amplifiers.